Wow! What a story. Once again John Nicholl takes the deep pain of a victim and turns it on its ear. This was Rebecca’s story. The story of a lost innocence and the damage that follows year after year until it creates a monster. Rebecca is juggling, and not quite as successfully as is needed. Her story becomes disturbing. Unable to even interact with her parents after a terrible and unresolved event, Rebecca is broken. I love Detective Inspector Gareth Gravel. His mind is quick and he is out of shape but I personally find him charming. Even when he is grinding a cigar beneath his heel. I found Detective Inspector Gareth Gravel to be such a visual character. He has been suffering from PTSD and sent on a vacation to clear his nerves. While he is visiting his son, he finds out about the head and arms that have been recovered in his sleepy city in Wales. Nicholl brings out the most human traits good and bad and creates a vivid and sorted tale. A tale where you question your own morality. His books remind me of the old saying. 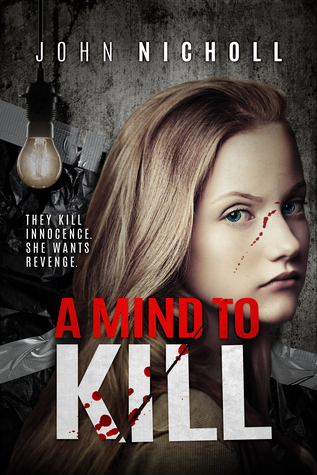 “There but by the grace of God, go I.” Both chilling and written in a frank and intense manner, A Mind to Kill, stands out as a psychological thriller that needs sharing. By now everyone should know that John Nicholl is the Thriller author that started me reading thrillers. If I had not lucked up onto his White is the Coldest Colour, I would have missed out on this masterpiece. With John Nicholl’s background in Social Services, you have to wonder how far fetched these cases are. I will keep reading them and if this is anything to go by, they just keep getting better and better. Rebecca, the tormented child that has grown into a savage killer in order to make wrongs right again in her own broken mind, is beautifully horrid to read about. Her sing song cadence is catchy and creepy at the same time. It certainly made me remember the little song from childhood, but with a whole new spin on it. You can find this psychological thriller in paperback and pre-order the Kindle e-book on Amazon. Posted on August 5, 2017 August 5, 2017 by Vicki GoodwinPosted in Book Review, OriginalTagged New Release Book Review, Psychological Thriller by John Nicholl, The Page Turner review. Previous Previous post: Seeking Artists of all Types, Share your Art here! Art Lovers, This is for Your Enjoyment Too! Oh this book sounds to creepy, Vicki. Great review. If you like creepy then meet John Nicholl. He is the author with the most unusual physiologically impaired people. They are addictive. Another favorite author of mine! Thank you do much for sharing!